That is a wonderful book that deserves to be back in print. I treasure my copy. By strange chance I am going to a cousins' reunion in South Carolina at the beginning of the week and have finally stopped dithering and will be coming up to Bouchercon at the end. I hope to get to your first panel, though I'm sure I will arrive in Raleigh in time. But I will definitely come to this one if I make it at all. I meant, I am NOT sure I will arrive in Raleigh in time. 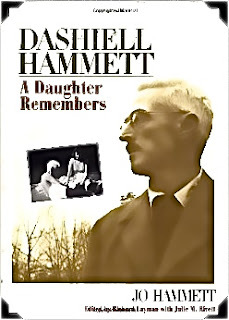 What this post reminds me of that I like best about Hammett's writing--and I suspect I would have found to like about him--is a lack of pretentiousness. Straightforward writing that did everything he needed it to do without making a big deal about it, providing no filter between the printed word and the reader. A lot harder to do than it looks, seeing as how all writers think they have something "important" to say, or they wouldn't be writing. N.C.W. : I did not know it was out of print. But yes, it is a wonderful book for a number of reasons. The anecdotes are touching, and funny, and they illuminate Hammett's writing in any number of interesting ways. I read A Daughter Remembers Saturday and Red Harvest yesterday, and a anecdote that Jo Hammett relates enabled me to spot a little Ira Gershwin tribute in Hammett's novel. The book is full of such things. Seana: That's a nice surprise. My first panel happens at 2:30 Thursday afternoon, and this one is at 8:30 Saturday morning. I hope to see you for some combination of panels, coffee, dinners, and gin and tonic. And that reminds me of another clue to Hammett's life I picked up in yesterday's reading of Red Harvest: Hammett must have liked gin and ginger ale. The Op drinks that in one scene in the novel, just as he had in the opening scene of The Bog Knockover in Jean Larrouy's dive. 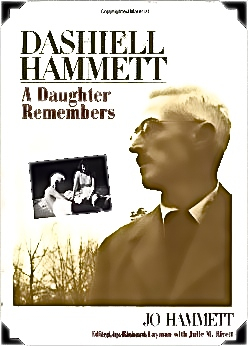 Dana: Hammett taught a mystery writing class in New York later in his life. One can imagine the course lasting less than a minute, Hammett telling the class: "Know everything, read everything, and wear your knowledge lightly." Yes, I hope to meet up for some combination of the above. I won't have my "entourage" with me this time, unless I can persuade any of the cousins to make the trek up, so there will be more flexibility. I love the Hammett quote. I'm trying to fit in a couple of his books before I get there. The Thin Man is more like the movie than I thought it would be, although for some reason I keep visualizing Humphrey Bogart instead of William Powell. Oops--it wasn't a quote but a distillation. I wish I could come up with a wisecrack about Zen being an illusion, with respect to your downsized entourage. And which Hammett quote/distillation do you mean? You're right that The Thin Man is rather like the movie adaptation. The notes of despair and sadness are undertones in the book, mixing unobtrusively with the buoyant manner of most of the story. That is a fascinating thing to see. Well, it is kind of an illusion, as Zen isn't their real name. I just meant what you wrote as being his one sentence advice on the writer's class. I do think the sadder undertones are more apparent in the book, although I don't think the movie is false to them. Hmm, Google just killed my reply by trying to trick me into giving my phone number on a security page rather than posting my comment. So let's try this again. Yes, my distillation is as imaginary as the name Zen, but both it and the name are pretty good I think. I agree that the movie version of The Tin Man is not false to the sadder undertones, but it plays them down a bit, alluding to them rather than out and out presenting them, one might say. I also don't remember the movie's having a counterpart to the wry philosophical exchange between Nick and Nora that ends the book. The Thin Man, that is, not the Tin Man, who did not appear on screen until a few years later. The Tin Man too is fairly sad, though. I haven't gotten to the end of the book yet, so look forward to that. It does seem hard to imagine a movie ending with a philosophical discussion. Well it's not quite a-- but I'll let you judge when you get there.